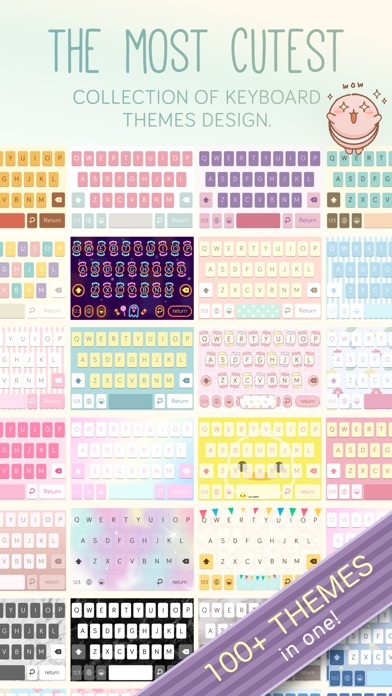 Discount 50% from 1.99 Great Price for 100+ Pastel Keyboard Themes. 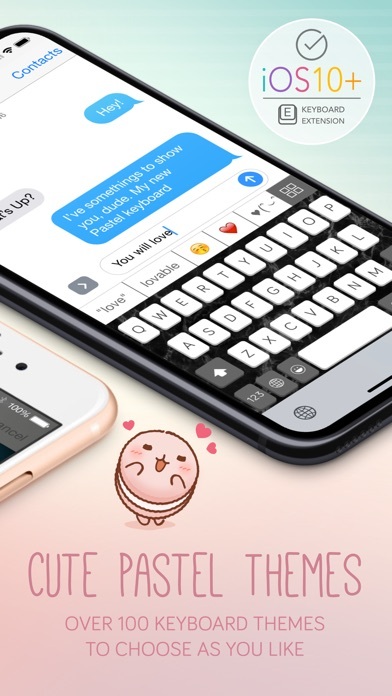 Pastel BuddyBar™ with word autocorrect, emoji suggestion, text art & emoji art and 100+ premium fonts! 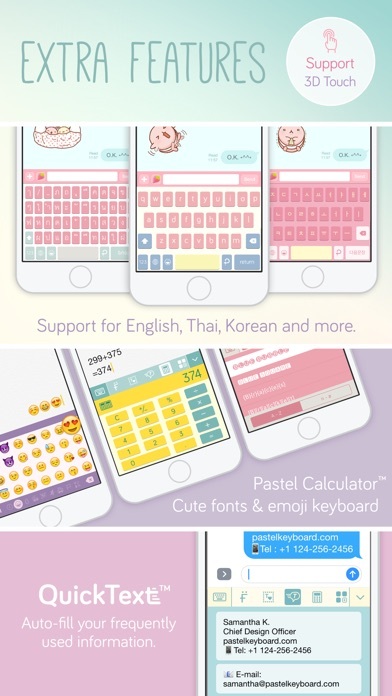 Pastel Keyboard™ comes with various of fun and useful features including English, Thai and etc. languages , Emoji keyboard + skin tones options, 30+ cute sounds, MagicSound™ and more! The first and only one third-party custom keyboard that support Thai keyboard in App Store. Featured by Apple in Thailand, Indonesia, China, Russia, Mexico, India, South Africa and Turkey! Featured in TrueMove H TV commercial. QuickText keep you frequently use sentences such as email address and signature, just tap once don’t need to repeat typing ever. Meet our new feature!! Pastel sticker™ Share Sticker by copy and paste & also offer iMessage app, Calculator Calculate on the keyboard and Numpad. 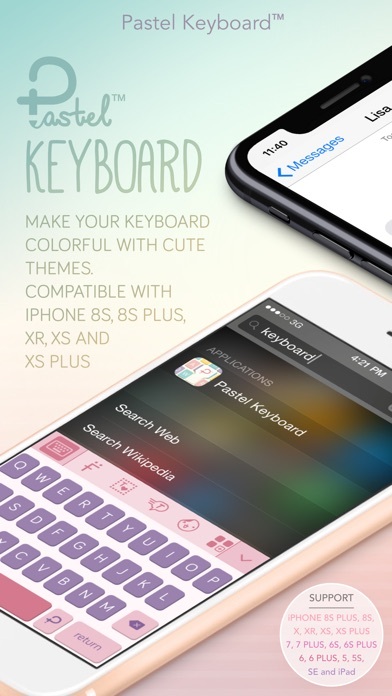 Pastel Keyboard™ - The #1 paid utility app on the App Store in more than 15 countries. - NEW! QuickPhoto™ Share your photos everywhere. - New!! Share themes your like to everyone. - Pastel Store Access to all the pack easily. - Select font size and bold on the keyboard. - 30+ keyboard click sounds. 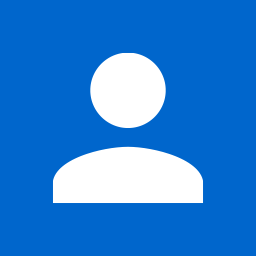 - Languages: English, Thai, Bahasa Indonesia, Russian, Spanish, Laos, Malay, Filipino, Vietnamese and Korean. - Tap and hold on spacebar to move cursor. - Favorite list: added themes will be loop in theme switcher. - Theme switcher, change themes on the keyboard. - Compatible with all iPhone and iPad models, on iOS10 and above. NEW! SANRIO THEMES AVAILABLE FOR PURCHASE. Full access, to 7,000+ Premium and Exclusive Special Themes such as Sanrio lead popular characters like by Hello Kitty, My Melody, Little Twin Stars, Cinnamorolll, Elite designers and many more. Make your keyboard cute without boring. We have both monthly and yearly subscription available. *Keyboard themes available may vary depending on the languages, countries and location. This subscription automatically renews for $4.49 a month after 3 days free trial. You can cancel anytime. If you upgrade Pastel Keyboard VIP subscription, payment will be charged to your iTune account. And your account will be charged for renewal 24-hours prior to the endow the current period. Subscriptions may be managed by you and auto-renewal may be turned off by going to the your Account Settings after purchase. Any unused portion of a free trial period, if offered, will be forfeited when you purchases a subscription. 1. 'Allow Full Access' in iOS Keyboard Settings in order to turn on click sound and more. Thank you for using Pastel Keyboard™ Your feedback is amazing! New!! VIP Premium Experience, You can choose to use keyboard theme even more. UPDATE NOW AND ENJOY TYPING! #1 Utilities Paid iPhone App in New Zealand, China, India, Mexico, Russia, South Africa, Ireland and Turkey! 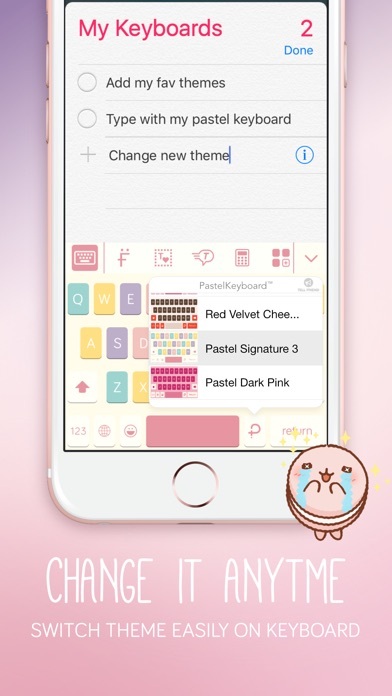 We hope you enjoy typing with Pastel Keyboard™. If you love this keyboard, please leave us a rating and review on the App Store. Every single review means a lot to us. The creator of Pastel Keyboard™ and many more!